Gravina 2, 11520 Rota, Spanje. 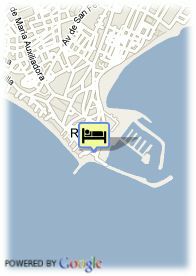 The hotel is has a privileged location on the same beach between the old town and the marina and fishing port of Rota. The elegance of its decoration the quality of the facilities and the staff's hospitality makes this hotel the perfect place to spend unforgettable holidays. The hotel offers 92 rooms with Bathroom and shower, heating, satellite TV, dial-phone, payable safe box, air conditioning, hairdryer, mini-bar, free Internet access and the majority with balcony or terrace. It also offers facilities Bar-Cafeteria, public Internet access, a la carte restaurant, buffet restaurant, pool for kids and adults, gym, hairdresser's, panoramic solarium, rent of covered parking, sauna and ice cabin. Golf on the Costa Ballena. Voor babybedjes wordt 14.45 € per extra babybedje aangerekend.